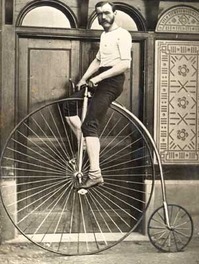 Sweet bike AND facial hair ! Besides, focusing on the good things from the past, like old-time slang is a welcome distraction from the tommy-rot of our present realities. "Tell it to Sweeney" is more creative and fun than "You are fake news!". 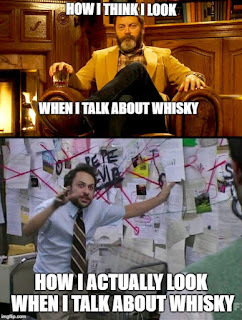 Whiskey makers know this and appeal to tradition and "the old ways" all the time. Back in my day ! Depending on which internet source you trust, the mashbill is 60%-63% corn, 27%-30% rye, and 10% malted barley. The age is, again according to internet speculation, somewhere between 4 and 7 years. 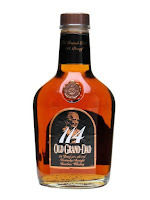 Old Grand Dad 114 is, then, a high-rye bourbon, bottled at a powerful 57% ABV (or 114 Proof, hence the name). It isn't readily available in Ontario, but I obtained a sample from a friend who can get it in the United States for $23-$27. Nose (undiluted): very fruity at first, cherry blossoms, a bit of vanilla and brown sugar (though much less than I expect from a bourbon) developing to oak tannins and rye spice in the background, maybe just a hint of mint in the tail end. There is very little alcohol prickle on the nose. I would never have guessed this was bottled at 57% ABV. As this sits in the glass, a slightly vegetal note appears in the background. Dried leaves. This is a terrific nose. Palate (undiluted): WOW !!! There’s that 57% ABV ! Very hot arrival, though not unpleasant at all. It isn’t “spiky” (like a hoppy beer) as much as it’s big, bold and warming. Lots more cherries. Sour cherries, with a bit of vanilla frosting. The rye spice is present, but it isn’t the star of this show at all. Adding water pushed the fruity notes way back. Fresh corn (still a little green) pops out of the glass. The nose actually seems to be “hotter” with the addition of water. Oak and tobacco notes next. The cherries are still there, but they’ve been pushed way back. Given some time to rest (5 minutes or so), the fruit comes back, but doesn’t dominate the way it did at full strength. The arrival on the palate is more typically bourbon-esque with water. Toffee, vanilla and oak notes dominate with the fresh corn next and that lovely fruity note pushed way back. After some resting time, the flavours feel like they’re getting a bit muted, relatively speaking. With water, the finish becomes far more vegetal (fresh tobacco?) though not much shorter. 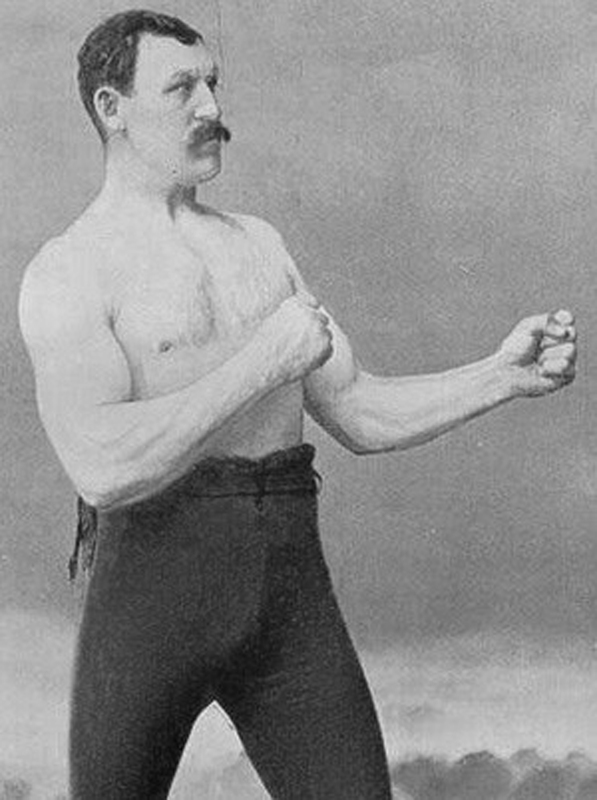 I prefer this one at full strength. 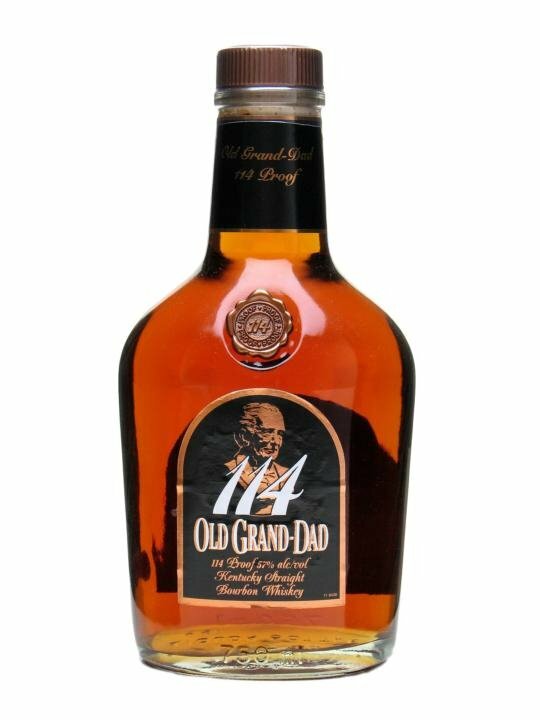 I really wish Old Grand Dad 114 was available in Ontario. This is a bourbon I would love to keep in my liquor cabinet at all times. It's terrific on its own and I'm sure the bold flavours and higher proof would stand up wonderfully in cocktails like (what else?) the Old Fashioned. This whiskey is proof that low price does NOT equal low quality. I highly recommend you pick up a bottle if you see one near you. Try it and you'll undoubtedly exclaim "Now you're on the trolley !" Now if you'll excuse me, I have to go see a man about a dog.